If you have an Emergency, dial 911! The 911 operator will dispatch the appropriate agency. The Town of LaGrange uses a cost-effective communication method to keep its residents informed. 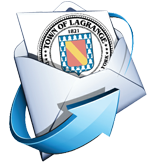 The LaGrangeDelivery public outreach service is a notification system available to all members of the community. LaGrangeDelivery takes information from the Town website and other sources and distributes it directly to subscribers via email, texts and social media. By subscribing through our website, residents are able to choose topics of interest, such as public meetings, advisories and/or press releases. You will automatically receive updates for any of the topics to which you subscribe. Find information about the LaGrange Sunrise Rotary, LaGrange Historical Society, Children's Home of Poughkeepsie - Therapeutic Foster Boarding Home Program, Math & Physics Exploration as well as other links of interest. The Town of LaGrange's 2005 comprehensive plan update analyzed the town's future growth and development potential and provided a forum for community members to participate in planning for the future of the town. The following controls allow you to increase and/or decrease webpage text size as well as to return text to its default size. Close this window first before using the controls to resize webpage text. Hold down the Ctrl key while pressing the + (plus) sign; for Mac users, hold down the command (Apple) key while pressing the + (plus) sign. Hold down the Ctrl key while pressing the - (minus) sign; for Mac users, hold down the command (Apple) key while pressing the - (minus) sign. To return to DEFAULT text size hold down the Ctrl key while pressing 0 (zero); for Mac users, hold down the command (Apple) key while pressing 0 (zero). InfoAccess is the new exciting GIS-based map application that was developed by Dutchess County OCIS as a shared service. It is integrated throughout the Town of LaGrange website wherever you see the InfoAccess icon. The general premise of InfoAccess is to take a broad-range of location-related information and make it viewable in themed "categories" on GIS maps. Keeping LaGrange Informed-We are pleased to announce that the new sign has been installed at Town Hall. Messages about upcoming meetings and events will be displayed, helping us keep the LaGrange community informed and involved. Here you can find some of our most requested forms, applications and important documents. You can also find additional information on our individual Department pages or on the Forms and Applications page, which contains all forms and applications available on the Town of LaGrange site.